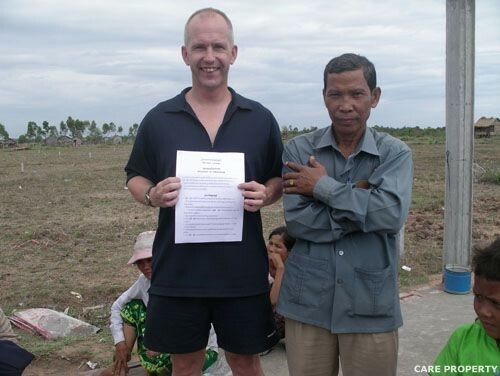 Mr. Coleman of the C-A-R-E Management Team built a small school in the village of Dei Thmei, about 5km from Siem Reap. A small Trust was set up in England to support the school, and to assist with educational and healthcare initiatives around Siem Reap. The Trust is named after a late family friend who dedicated his life to social and political causes. He was also a fully-ordained Buddhist priest. Since the school's initial construction in December 2004 the Hans Jensen Trust has been financially supported by Mr. Coleman's family and friends in England, and by donations from a range of sponsors including C-A-R-E. The project provided a full-time Khmer teacher giving lessons in reading and writing Khmer, and in speaking English. The Trust also provided the first clean water supply to the community via the installation of a well near the school. In February 2006 the students were taken on a field trip to the Angkor Wat temples where they showed great confidence in practicing their English skills on tourists. At Ta Prohm Temple they insisted on donating the small amounts of pocket money their families had given them for the day to a group of land mine victims. Mr. Coleman’s friend Mr. Gilles Zarco provided a small playground at the school in December 2007. He has been a tireless fund-raiser for the community and helped to provide a number of water wells plus a fleet of bicycles for the children. C-A-R-E has assisted Mr. Zarco wherever possible, providing staff and transport to assist his work. In February 2008 Mr. Zarco donated 2 large mosquito nets to each family in Dei Thmei.